Rearmed and refuelled, the first aircraft took off for their second offensive. The R.A.F. plotted the raiders returning to renew the attack from the direction of Le Havre, Caen, Cherbourg and the Channel Islands. 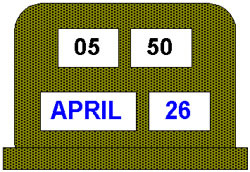 50 minutes after they took off the leading aircraft crossed the English coast between Bridport and the Isle of Wight. Fighter Command arranged 11 Beaufighter patrols and 17 Hurricane sorties, and these tried, unsuccessfully, to intercept the German aircraft. German aircraft were again in the skies over Bath. As a large number of fires had been started during the first raid, most of which were still burning, it was mostly high explosive bombs that were dropped during the second one. with many planes diving as low as 600 feet with impunity. No opposition was encountered over Bath during the hour-long attack. At the end of the attack, the aircraft headed back towards the south coast and their airfields in France. Fighter Command arranged for 13 additional fighters to take off in the hope of intercepting the German aircraft. These too were unsuccessful. But a Dornier 217 (pictured right) was dazzled by searchlights and crashed into Bottlebrush Down, near Handley Cross in Dorset. 10 minutes later, the first planes reached the English Channel. A local historian, John Penny, researched the RAF records and the Luftwaffe records that survived the war, and prepared a very detailed analysis of exactly what happened during the second attack. The first raid consisted of a high proportion of incendiaries, and although the Green Park and Kingsmead areas suffered badly from a number of high explosive bombs, and the streets near the gas works received a number of bombs which had just missed the gas works or the nearby railway sidings, there were relatively few casualties in the rest of the city. When the sirens announced the return of the bombers later that night, most residents, remembering how they were caught unawares by the first raid, sought shelter immediately. 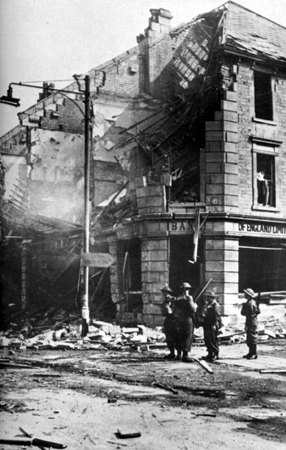 But some had a duty to be on the streets: the fire brigade, the police, the rescue squads, the doctors and ambulance crews were all at full stretch after the first raid, and had to shelter wherever they could as the bombs fell again. This time, it was mostly high explosive bombs that fell. Fires were still burning from the earlier raid, and there was no need for incendiaries to provide light to guide the bomb aimers. When daylight came the following day, it was clear to everyone that Bath had become a hazardous place. Few believed that the previous night's attacks would be the only ones Bath suffered. During daylight hours there was much activity. Ambulances and fire engines from other areas arrived in Bath to help. Some fires still burned from the night before, attended by fire crews. Rescue parties checked damaged buildings looking for trapped survivors. Sometimes they found somebody alive in a building so damaged that it looked as though nobody could survive, like this picture of a house in Beechen Cliff Place where seven people were rescued alive from their Morrison Shelter. But all too often, rescue parties found in the ruins somebody who had been killed. Those who had survived were doing what they could to clear up broken glass and soot dislodged from chimneys in their own homes, or helping their neighbours if they had fared worse. 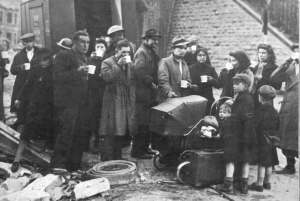 Many were trying to establish whether their friends or relatives in other parts of the city had survived. Many of the telephones that did exist were not working. 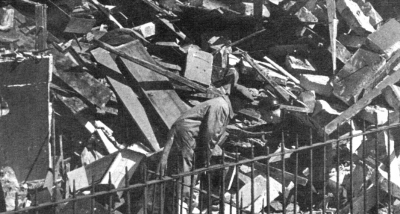 The bombing had brought down telephone lines in a number of areas. One of the telephones that was put out of action like this was the one in the Civil Defence Headquarters, so messengers on bicycles or motorcycles relayed instructions to ambulances and fire crews. Very few houses had telephones in 1942, so this meant going to find out. Sometimes the most direct route was blocked by bomb craters, rubble from fallen houses, or by unexploded bombs, so this may have involved a long walk. In various parts of the city, damage to supply pipes and cables left many without gas or water. Electricity supplies were not badly affected and were restored to many areas quite quickly, but some remained without. For the people without gas, water or electricity, and those whose houses were too badly damaged to use, the immediate problem was food and refreshments. Emergency feeding stations were arranged by Civil Defence, and these supplemented the hotels and restaurants that were still functioning. 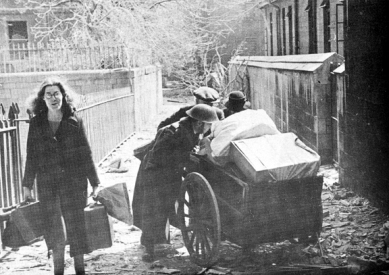 Mobile canteens were brought in, and these served tea and sandwiches to the homeless and to Civil Defence workers alike. The canteen in the Abbey Churchyard had served up 250 gallons (1150 litres) of tea by lunchtime. The First Aid Centres had coped well, but the more seriously injured were overwhelming the facilities at the hospitals. It was decided to transfer out to other hospitals in the surrounding areas all the patients whose treatment had completed and were just convalescing in the wards, so that beds could be freed for new emergencies. Some of the damaged buildings contained valuable items and because of that there was a risk of theft. The Home Guard was stationed at damaged banks and shops selling high value items to prevent looting. The picture shows the Home Guard outside the Bank, next door to the Post Office, in Wellsway. For those whose homes had been rendered unusable, the priority was to find somewhere to live. Those with friends or relatives outside Bath but within travelling distance went there. Some went to the Rest Centres, until many were completely full. Civil Defence estimated that by mid-morning the total in the Rest Centres was around 1,300, and by later in the day this had grown to 1,500. This was a major concern for the Civil Defence planners, because if a crowded Rest Centre was bombed the next night, the number of casualties would be enormous. As night fell, many Bath residents feared that the bombers would return. Some carried on as normal, waiting to find out if the air raid warning would sound again. Some went straight to the shelters for the night, without waiting for the siren to sound. Some with relatives nearby but out of the city went to stay with them in relative safety. If they were able to rescue any of their possessions from their ruined homes, they took them with them if they could. Some became what were known as Trekkers. Trekkers were people who left the city at night, but returned during the day. Usually they went on foot, seeking places where there were no targets to attract bombers. Ditches, hedges, barns and woodland were considered preferable to the comfort of a home that might be bombed. The roads to Englishcombe, Batheaston, Newton St Loe and similar places of relative safety were to witness a steady stream of people leaving the city of Bath. The authorities had mixed views about trekkers. On the one hand, once out of the city, they became people who were unlikely to become casualties, and who placed no demands on emergency food or accommodation services. On the other hand, anybody who was capable of trekking to safety was by definition fit enough to help with fire watching and emergency repairs, and this loss of manpower was undesirable. Even worse, some trekkers were essential personnel, and by leaving the city they left the emergency services short of workers. There are no official estimates of how many people left the city on the Sunday night, but local historians believe that it was thousands rather than hundreds.